Guy Massey is a sound engineer. 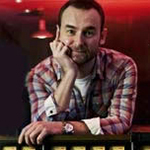 As such he has worked with The Divine Comedy and The Duckworth Lewis Method since 2004. Guy Massey is also well-known for his works on the Beatles back catalogue. He worked on the 2003 album Let It Be Naked, and has worked on the 2009 remasters of their back catalogue (The Beatles Stereo Box Set & The Beatles in Mono) for which he won a Grammy for Best Historial Album. In 2014, following his work on The Duckworth Lewis Method’s Sticky Wickets, he wins the MPG Award for Recording Engineer of the Year. .